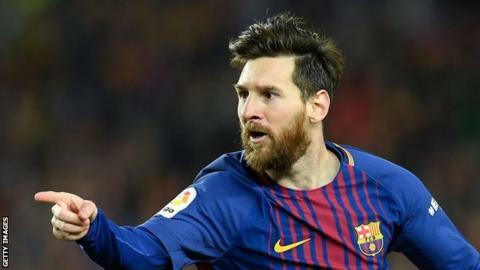 Barcelona forward Lionel Messi says he is "increasingly sure" that he will never play for another European club. Messi, who has spent his whole senior career with Barca, scoring 552 goals, has been linked with Pep Guardiola's Manchester City in the past. The 30-year-old suggested that he could return to his homeland in Argentina to play for Newell's Old Boys. "I always said I wanted to play in Argentine football one day," Messi told Argentine television station El Trece. "I don't know if it will happen but I have it in my mind. It would be at Newell's, nowhere else. I would like to do that for at least six months, but you never know what will happen. "I'm increasingly sure that in Europe, Barcelona will be my only club." Messi, who is with the Argentina squad preparing for the 2018 World Cup in Russia, started out at Newell's Old Boys before joining Barcelona aged 13. "The other day I was talking to a friend and he told me 'if you had chosen Spain, you'd be a World Cup winner already', but it wouldn't have been the same," added Messi. "Obviously in no moment did I think about doing that. To win it with Argentina would be something unique."